Lately my drive and focus have been lacking. It’s like I’ve had brain fog. This happens from time to time. It’s annoying, but being aware of it has its upside. It allows me to try different ways to get it to clear. But sometimes it clears on its own. Like this morning. I was struggling to want to get up because I had nothing I needed to do until 1p. Then I remembered I have a bunch of dishes to do. So I got up, got a dent in the dishes, and got some tidying up done in the apartment. The tidying continued into the office. There have been many different people saying that being organized in your life means you’re organized in your brain. It’s true for me. The more I clean up, the more clear my brain feels, the more focused I feel. Here’s to de-cluttering! Both physically and mentally! This is how I’ve been feeling, more or less, lately. What makes it worse is it’s not just one thing. If it was just one thing, I could manage it. But it’s work and it’s school and it’s the mess at home and it’s…on and on and on. It just feels like I can’t do anything right lately. I keep messing up stuff for school. Work has been slow, which I can’t do anything about. Well, I could try driving to different parts of Columbus, but that could just be a waste of time, money, and gas. Work being slow messes with finances, which causes all sorts of problems. It’s just a chain reaction. Although I have had a few things that did work. This week I’ve sold two more shield bracelets at my Etsy store! Less sitting around the apartment and pocket money for me! Also, I managed to come up with a great lunch today. I woke up this morning thinking “What can I do with my naan?” I decided to make a run down to Lucky’s and get some chicken, olives, mushrooms, and garlic. I chopped it up, put it over goat cheese and naan and threw it in the oven. After 6 minutes and a drizzle of olive oil, I dove in to an amazing lunch. It also gave me a lot of awesome chicken. I get a rotisserie chicken and strip it down. It gives me a weeks worth of amazing, tender, delicious chicken. Now, if either my hubby would get up so I can put things away in the bedroom, or someone would need a Lyft, my day would get much better. Forget spring cleaning, New Years cleaning is the new thing! Eh. Either way, I have been on a bit of a cleaning kick these past few days. Tuesday at work I got my desk in pretty good shape before leaving. And I’ve worked on it more today. Yesterday I did some cleaning in my room (so now there’s more than a path leading to my computer) and did some magic in the kitchen. I had cleaned the stove top earlier in the week. Yesterday I got us completely caught up on dishes, and I cleaned some of the counters too. I kept looking into the kitchen amazed at how clean it was. There were no dirty dishes sitting out. Period. I thought it was kinda weird to do that. Hubby said it was sad. I’m sticking with weird. And that reminds me of something. I have another reason to love baking soda. It is great for scrubbing things that you don’t want scratched up! Just baking soda, a damp paper towel, and elbow grease removed a ton of baked-on grease and dirt from the stove top. It even helps to get my French White dishes cleaner than the dishwasher can get them. It’s awesome! The cleaning will continue. Tonight I’m going to fold my laundry, thus reclaiming even more of the living room. This weekend I’m going to get my room in shape. At least enough to get it so I can use my sewing machine. It should be obvious by now, but just to be clear, I really don’t like cleaning. This is weird for me. I’m sure Hubby is wondering “Who is this? What did they do with my wife? Can I keep her?” My tendency toward clutter kinda drives him nuts. Apathetic: not having or showing much emotion or interest. Yep. That pretty much describes me right now (although I’m sure the lack of sleep isn’t helping). When I’m not at school I just don’t care. At work, I don’t care. At home, I don’t care. Eating, I don’t care. I’m really starting to get annoyed by my lack of caring. Thankfully this is one of those instances where you find the right word to describe things and it motivates you to not be that anymore. I buy this great food to make some great lunches with for the week and what do I do? Go out and get lunch every day. I have enough steel cut oats at home to last me for three weeks of breakfasts, but they’re sitting in the freezer. The living room and my room are disaster areas at home. But when I get home from work all I want to do is sit in front of the TV and maybe knit. That is going to change starting tonight. Well, it’s actually changed a bit already since I’ve been quite productive at work so far. Anyway. When I get home from work, I am taking a nap. I am tired. I have been tired. I need a nap. When I am no longer tired, I’ll get up. That might be after a few hours, it may be tomorrow morning. Either way, I’m going to work on getting things cleaned up at home. I’ll get the laundry folded and put away. I’ll get the mountain of dirty clothes washed and clean and put them away. I’ll be a cooking fool and make oatmeal for the week, get protein ready for lunch, make more coconut peanut butter, turn a few heads of kale into chips, and eat healthy. I’ll get groceries for the week and work on my room. I may even break out the vacuum! Hopefully that won’t take up the whole weekend, but if it does, at least I’ll have managed to get a lot done and be ready for the upcoming week. Now if I could just have the energy to match that motivation, I’d be set. I was planning to spend this afternoon cleaning up my room. I am not a neat person, so it gets messy quite quickly. But every once in a while I get the urge to go through stuff and clean it up. I got a good start. Cleaned up two cabinets and moved more stuff into them so I could rearrange things and get more off the floor. I also had a poster I wanted to rehang so it wasn’t crooked. I started to nail in the support when I remembered my hubby was asleep in the next room. Oops. I stopped, hoping I hadn’t woke him up. I had. As “punishment” I was snuggled for half an hour. I can’t complain about the snuggles. But I am that kind of person whose desire to keep working on something can be derailed easily. It is so frustrating! I came back into the room and got a little more done. But now I just want to hang out and do nothing. I’m hoping it will return because there’s a lot in here and I want it put away! I decided to go ahead and make a few changes to the blog. I feel it now reflects myself more accurately. I’ve removed anything that divided this blog up into the many blogs it used to be. I hugely reduced the amount of categories there are to make it simpler to get around. I’m hoping this will help me to post more since it’s more fluid and much less constricted as to where posts can be. I have devoted today to getting my room clean. Yeah, that’s not going so well. I have a hard time concentrating on one thing at a time for a long time. I’ve gotten quite a bit done, but it hasn’t made a huge impact. I really need to get back to it, because this place is an absolute mess and I need my space here. I need somewhere that I can retreat to. Somewhere I can relax. Somewhere I can curl up with a book. Somewhere I can spread out and work on a costume or some knitting. It just becomes a dumping ground so quickly. I really need to work on the storage problem I seem to have and be able to keep it clean in here! Okay. Enough distractions. Back to work. Found a use for Coke! I was talking with my friend Sunday about how our tub drain isn’t flowing all that well. I mentioned that I dumped the last of our white vinegar down there to try to clear it up. It helped, but it still ran slow. Then she told me something I never would have thought of. 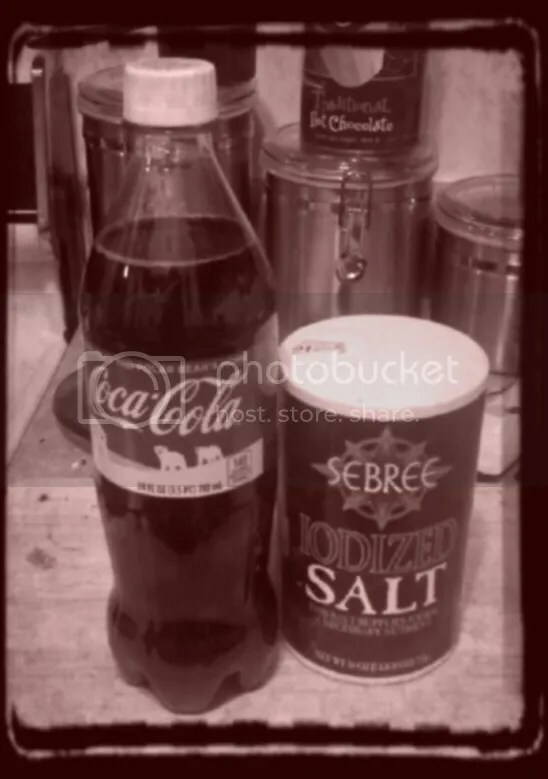 Salt and Coca-Cola. It seems like every green/natural blogger posts about their love for the white stuff at some time. Now it’s my turn! Baking soda has been a staple in my life since I started this journey. I’ve been using it to clean my scalp and hair for almost a year now. It’s part of my cleaning supplies, when I get around to cleaning. But today I read an article that listed 40 uses for baking soda. I recognized a few, would never use some, and a lot I haven’t heard before but want to start using. So here’s my list based off of theirs. The ones in bold are new to me! For safe, effective cleaning of bathroom tubs, tile, and sinks — even fiberglass and glossy tiles — sprinkle baking soda lightly on a clean damp sponge and scrub as usual. Rinse thoroughly and wipe dry. For extra cleaning power, make a paste with baking soda, coarse salt, and liquid dish soap — let it sit then scour off. Add 2 heaping tablespoons baking soda (along with your regular dish detergent) to the dish water to help cut grease and foods left on dishes, pots, and pans. For cooked-on foods, let them soak in the baking soda and detergent with water first, then use dry baking soda on a clean damp sponge or cloth as a scratch-less scouring powder. Baking soda on a clean damp sponge cleans gently inside and outside the microwave and never leaves a harsh chemical smell. Rinse well with water. Sprinkle baking soda onto the bottom of the oven. Spray with water to dampen the baking soda. Let sit overnight. In the morning, scrub, scoop the baking soda and grime out with a sponge, or vacuum, and rinse. Clean and remove marks (even crayon) from walls and painted furniture by applying baking soda to a damp sponge and rubbing lightly. Wipe off with a clean, dry cloth. Clean and deodorize your vinyl shower curtain by sprinkling baking soda directly on a clean damp sponge or brush. Scrub the shower curtain and rinse clean. Hang it up to dry. Use baking soda to clean your car lights, chrome, windows, tires, vinyl seats, and floor mats without worrying about unwanted scratch marks. Use a baking soda solution of 1/4 cup baking soda in 1 quart of warm water. Apply with a sponge or soft cloth to remove road grime, tree sap, bugs, and tar. For stubborn stains use baking soda sprinkled on a damp sponge or soft brush. Eliminate odors by sprinkling baking soda directly on fabric car seats and carpets. Wait 15 minutes (or longer for strong odors) and vacuum up the baking soda. Place an open box in the back of the fridge to neutralize odors. Sprinkle baking soda on the bottom of your trashcan to keep stinky trash smells at bay. Clean your recyclables container periodically by sprinkling baking soda on a damp sponge. Wipe clean and rinse. Also, sprinkle baking soda on top as you add recyclables to the bin. Use baking soda to deodorize before you run the dishwasher and then as a gentle cleanser in the wash cycle. Liberally sprinkle baking soda on the carpet. Let set overnight or as long as possible (the longer it sets the better it works). Sweep up the larger amounts of baking soda, and vacuum up the rest. (Note that your vacuum cleaner bag will get full and heavy.) An added bonus: You’ll also deodorize your vacuum cleaner. Keep odors from spreading in smelly sneakers by shaking baking soda into them when not in use. Shake out before wearing. Baking soda can help in the initial handling of minor grease or electrical kitchen fires, because when baking soda is heated, it gives off carbon dioxide, which helps to smother the flames. For small cooking fires (frying pans, broilers, ovens, grills), turn off the gas or electricity if you can safely do so. Stand back and throw handfuls of baking soda at the base of the flame to help put out the fire — and call the fire department just to be safe. So that’s it! It’s actually the majority of the list. I can’t wait to start using these tips. I may just have to get more when we go grocery shopping after we move. Moving as little as possible is our goal. Well, it’s more of not adding to what we’re moving unless it’s necessary. Natural Evolution: It’s Becoming Obvious!! It’s so nice. As I look around our place, I see so much more green and natural products. The bathroom is the biggest change. All the cleaning products are natural, as you already know. All of my personal care products are natural, and I feel better for it. I’m getting the hang of no ‘poo. I’ve been able to have at least three full days in between washings. My face cleaning stuff is increasingly Burt’s Bees products. As I mentioned before, my toner’s now BB’s Tomato Toner. I will admit, the main reason for all the BB’s stuff is the availability and the affordability. But also I believe that using mainly stuff from one company is a good thing because they’re made to work together. Our paper products are better, but can still be improved. We have Green toilet paper which is 90% post-consumer recycled paper. When I buy tissues I get Seventh Generation’s, but my husband still prefers to buy Kleenex or Puffs. I’m not going to stop him, especially if we need tissues and he’s paying for them. The laundry room is the room that has seen the most recent changes. Last month I bought Method’s wet dryer sheets. We’ve been using Seventh Generation’s bleach. On Wednesday I was able to buy the last thing. We are finally almost out of Tide Cold Water. I picked up Seventh Generation’s laundry detergent. Probably the next time I do laundry, all three products are getting used. I am soooo happy!! !